Layla the Black Lab is beautiful in this soulful portrait by Amar Shrestha. 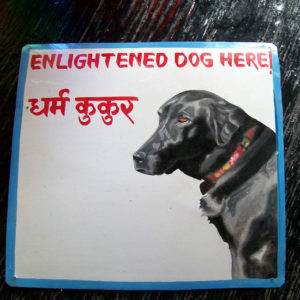 Killian the Black Labrador Retreiver as 'pented' by Amar Shrestha. 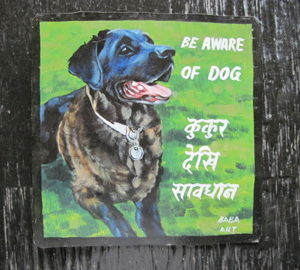 Baba hand painted this portrait of Tuki the Black Lab on metal. Cooper is absolutely wonderful in this finely detailed portrait, that includes glowing dark eyes. 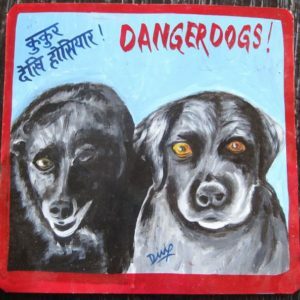 This may be Dilip’s best painting yet. Cooper the Black Lab is currently available at Nomad in Boston. Please contact them at (617) 497-6677, and they will be happy to assist you with your purchases. Their website is NomadCambridge.com. This is a particular favorite of mine. 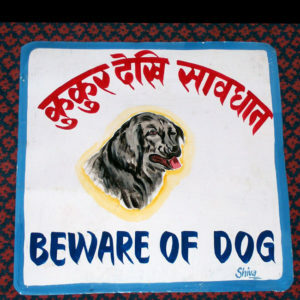 Taken from a photo in an ad by Bruce Weber, Ramesh at Om Art made Bruce's dog look more rabid than covered in bling. This would keep zombies away from your door. 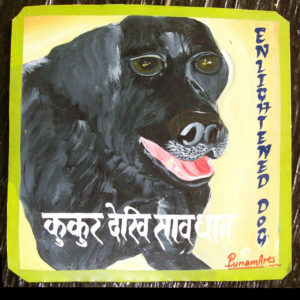 This is a soulful and naive painting of Killian the Black Lab by Punam. This lovely Black Lab is accompanied by a lady brushing her long black hair. 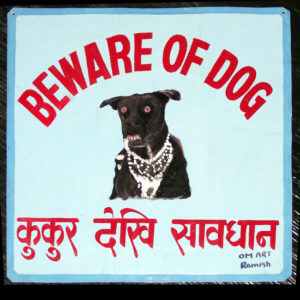 Sagar occasionally puts women in his portraits of dogs. 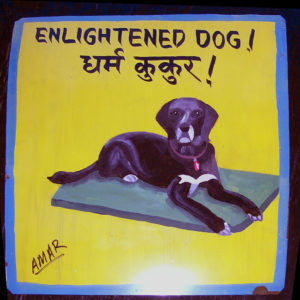 This is by an artist whose studio has disappeared, replaced by an auto showroom on New Road in Pokhara. One of my most naive artists, I wish Shiva the best of luck. 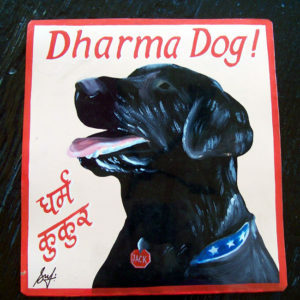 Jack the Black Lab is a Dharma Dog in this hand painted naive portrait by Sufraj Khadka. 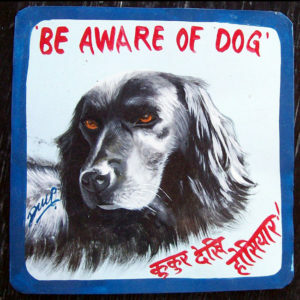 This is a lovely portrait of a dog with some Black Lab mixed in there. 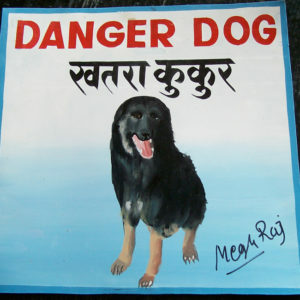 Hand painted by Megh Raj. 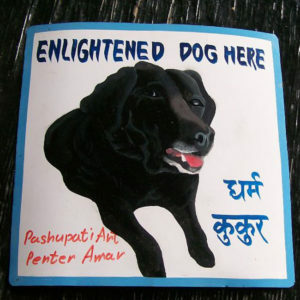 Davey the Enlightened Dog by Amar Shrestha. 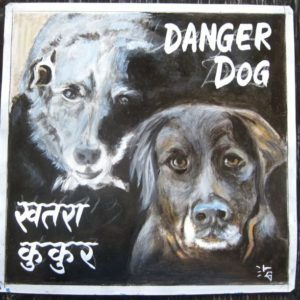 Magic and Marley are a happy couple in thier hand painted portrait by Dilip Niroj. Magic and Marley are two Black Labs. Sagar was given two separate photos of the dogs and the juxtaposition of the two dog friends was up to him. 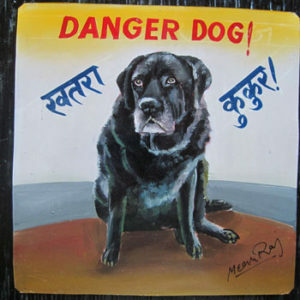 Maggie the Black Lab was hand painted on metal by Megh Raj Thapa. Maggie looks like she is hungry! Now available at Cafam.org (Craft & Folk Art Museum). 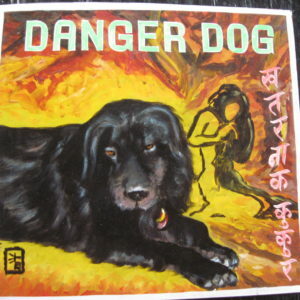 You can buy and Danger Dog and support this fine museum at the same time. 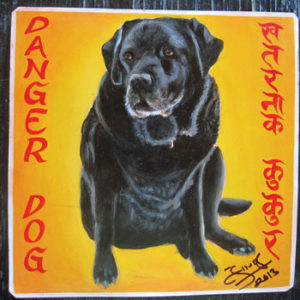 Sagar Bitsa hand painted Maggie the Black Lab against a dramatic yellow background, bringing out her beautiful black fur.